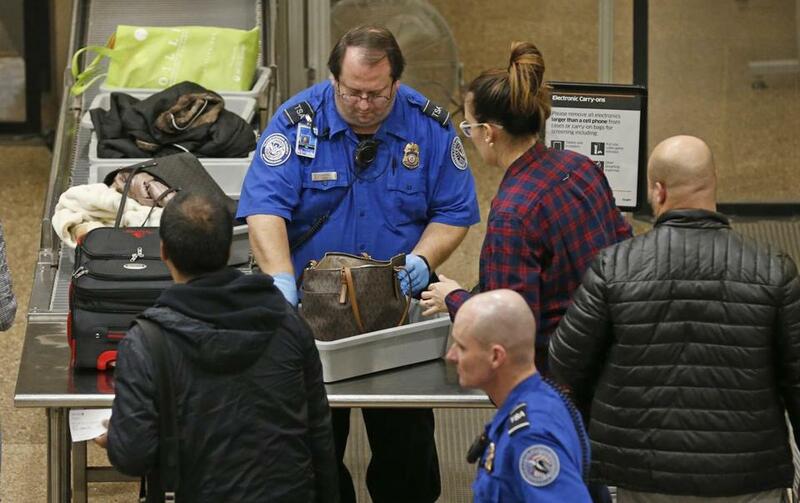 A TSA worker helped passengers at the Salt Lake City International Airport on Wednesday. ‘‘Every penny that we don’t have to spend is helpful,’’ Cara Mangone said Wednesday as she picked up donated goods being distributed at the airport by fellow members of the American Federation of Government Employees. ‘‘I just wanted to support the federal workers who are furloughed because of the inaction of our government leaders,’’ said Brian Couch, wearing a Kansas City Chiefs ball cap as he dropped off his donation. The airport in Pittsburgh provided a free lunch to TSA workers on what should have been their payday last Friday. ‘‘Our Operation Thank You free lunch program initially was only Fridays but because we’re hearing from several food vendors who want to donate, it’s possible it will be increased to more days,’’ airport spokesman Bob Kerlik said in an email. ‘‘We want to ... assist those who are hurting by taking a little weight off of their shoulders during this time,’’ Robbie Makinen, CEO and President of the authority, said in a news release about the program, which began Tuesday.